Annibal Caro, the most illustrious citizen Civitanova Marche has ever had, a writer, a translator, a poet and a playwright, was born on 6th June 1507 from Giovambattista Caro – a well-to-do apothecaries who had also held some important public offices – and Celanzia Centofiorini, from a noble family of the town. He studied at first in his birthplace and then in Fermo, under the guidance of the humanist Rodolfo Iracinto, from Monterubbiano (now in the province of Fermo), for whom he composed, at the age of fourteen, an epigram in hexameters, which testifies his precocious literary calling. In 1525 he moved to Florence, one of the most important Italian cultural and financial centres, where he had the opportunity to meet Benedetto Varchi and was introduced in the household of banker Luigi Gaddi as an institutor of his nephews. However he maintained solid relations with his hometown, where he came back several times to visit his brothers and nephews and to take care of his small holder interests. He also looked after the interests of the town of Civitanova, that obtained, thanks to his intervention, the exemption from payment of a tribute to the Apostolical Chamber. In return he and his family until the third generation were exempted from any taxation. Later on he moved to Rome as a secretary to Mgr. Giovanni Gaddi, Luigi’s brother, who held an important position in the ecclesiastical hierarchy of that time. In his frequent travels he was also able to establish contacts with the literary society of Naples. In the end he entered the orbit of the Farnese family as secretary to Pier Luigi, for whom he made long journeys into France and the Flanders, eventually becoming counsellor in the newborn duchy of Parma and Piacenza. In 1543, on order of his new lord, Caro undertook the composition of a five-act play, "Gli Straccioni" (The Scruffy Scoundrels), that was to reveal itself as one of the most important comedies of the sixteenth century. It was also defined the prototype of the Italian bourgeois comedy. Its author showed an exacting attention in the stylistic definition of the characters, particularly the minor ones, and its talents as a fine and witty literate give the play a tone of pleasantness and elegance. In 1555 Cardinal Alessandro Farnese had him given the title of Grace Knight of the Order of Malta. and assigned him a Jerosolimitan commenda of his in Montefiascone, titles worth a nobleman which let him reach the height of social prestige. In the following years he was at the service of the powerful cardinal Alessandro Farnese, being able in the end to go back to Rome, were he spent years of moderate serenity. In 1563 he retired to private life, alternating his residence between Rome and the small villa he had got built near Frascati (the so-called “Carovilla”): in these years of intellectual otium he started translating into Italian Publius Vergilius Maro’s Aeneid in the free spirit that always marked his life. In this translation, that was to be admired for its harmony and the musicality of its verse, he tested the validity of the vulgar compared to the Latin language. Among his most admired works there are: a "Canzoniere", that comprehends about one hundred sonnets and five songs, his free translation from ancient Greek of Longus Sophista’s "Gli amori Pastorali di Dafni e Cloe" which turned this novel into a refined work keeping its original grace; above all the hundreds of Letters, of various subjects, not very new as for the ideas, but very elegant and rich in wit and spirit of observation, which were published posthumously in several editions. Very famous is his literary dispute with Ludovico Castelvetro (1507-1571) that made him write his "Apologia". 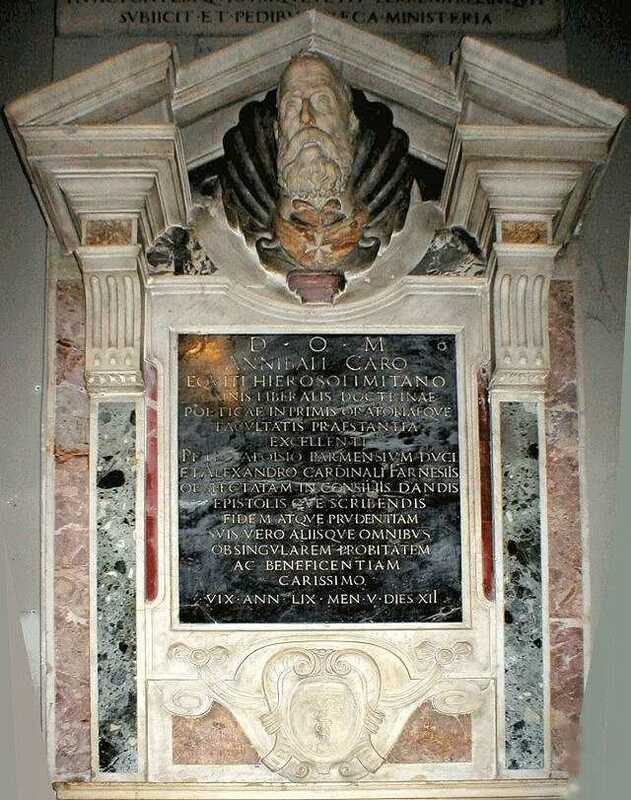 Annibal Caro died in his last Rome dwelling on 17th November 1566 and was buried in the Basilica of St. Lorenzo in Damaso in Rome.